The Beatitudes exhibit the natural progression of the transformation that comes only through Jesus Christ and by the power of the Holy Spirit. In other words, the Beatitudes tell us how God will changes us if we let Him. Those who seek this transformation are "blessed" or "approved of God." True happiness in life comes when one lives in the blessings of God’s approval and the benefits of giving your entire life to Him. First in our series, we looked at the "poor in Spirit." The poor in Spirit are those who realize their "spiritual bankruptcy" and that they are totally dependent upon God. Second, we looked at "spiritual mourning." Spiritual mourning is the natural response to poorness of spirit as one realizes the ramifications of their sin. Today we look at the next step of Christian transformation. This beatitude is opposed to everything which the natural man thinks. The world thinks in terms of strength and power, of ability, self-assurance, and aggressiveness. Yet Jesus said "Blessed are the meek; for they shall inherit the earth." What is He telling us? Originally written in Greek, the word used for “meek” is "praus". That word describes the attitude of spirit by which we accept God’s dealings with us as good and do not dispute or resist. It is a condition of mind and heart which demonstrates meekness, not in weakness but in power. It is a balance born in strength of character. As we have done with the previous beatitudes, let’s first determine what meekness is not. Meek does not mean weak or wimpy. It does not mean indolent or slothful. The opposite of meekness is SELF-ASSERTIVE, AMBITIOUS, PUSHY, HAUGHTY, COCKY, EGOTISTICAL, VAIN, CONCEITED. Meekness is not a natural quality. It is a characteristic of the Holy Spirit that is developed in us by the grace of God. 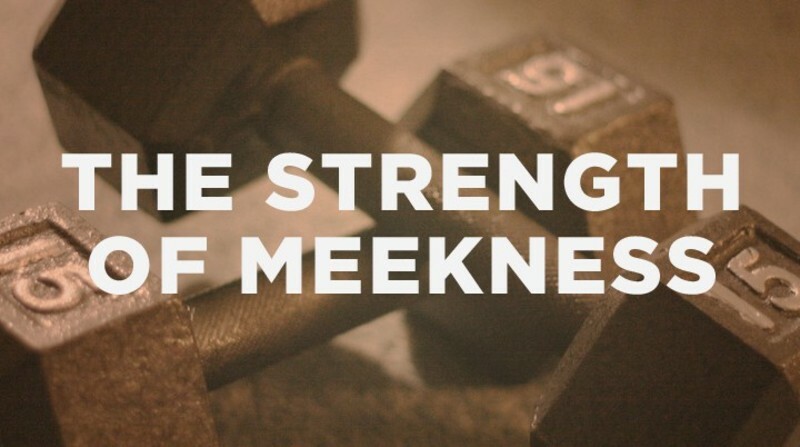 Actually, meekness is compatible with great strength. It is compatible with great authority and power. Only two people in the Bible are actually described as meek. Both had great authority and power. Moses manifested great courage and leadership. He certainly wasn’t weak. By the way, who wrote that statement in Numbers 12:3? Moses wrote it. God told Moses to write that. Only a meek man could write that and not become prideful and arrogant. Jesus was meek but he wasn’t weak. He was humble, gentle, loving, and kind. Yet He had tremendous courage to confront the false teaching of the Pharisees and Sadducees. He had the courage to drive out of the temple those who were desecrating it by their trade. He had the courage to endure the cross and despise its shame even when He had the power and authority to call angels to His rescue. True meekness has to do with inward discipline and not outer weakness. An example of meekness is anger under control. Sometimes we think that a meek person never gets angry. That is not the case, for the Bible says, "Be angry and sin not." Even Jesus got angry. The meek person has discovered a balance between never showing anger, and excessive anger, between too little anger and too much anger. It is never right to be angry for any insult or injury to ourselves. We must never give way to resentment—that is our battle with anger. It is often right to be angry at injuries done to others. Selfish anger is sin. Selfless anger is often needed. Meekness can also be described as strength under control. For example, a horse is a large strong animal. He is also a useful animal, but in order for him to be useful, he must be broken. After he is broken, he is just as strong as before; however, his strength is now under control. He is strong but gentle. He is a picture of strength under control. However, he had to be broken to become submissive to the bridle and bit, as well as to his master. That is a picture of what God has to do in us. We are creatures who want to run wild. God wants to bless us and use us, but before He can use us, we have to be broken. Meekness is that temper of spirit in which we accept God’s dealings with us as good, and therefore we don’t dispute or resist God’s will. The meek person no longer fights against God but submits to Him. That sounds good, but it isn’t natural. It is not our nature to submit. Meekness is a characteristic of the Holy Spirit. When the Holy Spirit is in control, we have the grace and power to be meek. The Beatitudes are about learning what changes the Holy Spirit wants to make in our lives. The Holy Spirit knows those areas where we’ve blown it, and He hasn’t come to rub it in – He’s come to rub them out! He hasn’t come to condemn us, but to change us into the image of Jesus. These first three beatitudes are designed to break our sinful nature so others can see the life of the Spirit working within us. And after meekness is developed in our lives, God gives us an inheritance on this earth—responsibilities—for the purpose of bringing others to Jesus Christ. Until we are meek, God cannot use us. 1. When someone neglects you, are you a servant, or demanding? It is so easy to be concerned only with ourselves and to demand attention when someone neglects us. The first place to practice a meek spirit is on those who serve you. Show appreciation and serve one another in the family, at school, at work, at places of business, at shopping malls, and to everyone you meet. It not only produces a good feeling, it enhances your Christian testimony. To grow in meekness, serve those who neglect you. Become their servant. It is the best way to get their attention and be a witness for Christ to them. 2. When someone hurts you, are you forgiving, or begrudging? Meekness is the ability to accept hurt without retaliating. Jesus is our model. 1 Pet 2:23 When they hurled their insults at him, he did not retaliate; when he suffered, he made no threats. Instead, he entrusted himself to him who judges justly. When we react to someone, we are letting that person control our emotions. No one else can dictate how we react; that decision is ours alone. If we lose our cool, start to get mad, and lash out, people will not only stop relating to us, they will lose respect and trust in us. 1 Pet 3:9 Do not repay evil with evil or insult with insult, but with blessing, because to this you were called so that you may inherit a blessing. 3. When someone disappoints you, are you understanding, or unsympathetic? Whether it’s a spouse, a child, a friend, or a co-worker, understanding is critical in relationships. How many times do we try so hard to prove our point that we fail to listen? We can only be truly understanding when we have meekness. 4. When someone criticizes you, are you gracious, or spiteful? As the years in the wilderness rolled by, Moses’ leadership was tested in some surprising ways. With all that was happening, he sure didn’t need any opposition from his brother and sister, but they challenged his leadership. Now, Aaron and Miriam were not without recognition or title. God had assigned them important places in the community as priest and prophetess. Nevertheless, Aaron and Miriam thought they should have more authority, because Moses was married to an Ethiopian, a woman outside the Hebrew family of faith. Num 12:1-2 Miriam and Aaron began to talk against Moses because of his Cushite wife, for he had married a Cushite. "Has the LORD spoken only through Moses?" they asked. "Hasn't he also spoken through us?" And the LORD heard this. How do you handle critics? Do you get defensive? Do you feel the need to clear your name? God uses criticism to see if we will stay meek or react. Some criticism is beneficial, but notice Moses’ meek spirit in response to the self-promoting criticism from his siblings. Num 12:4-15 At once the LORD said to Moses, Aaron and Miriam, "Come out to the Tent of Meeting, all three of you." So the three of them came out. Then the LORD came down in a pillar of cloud; he stood at the entrance to the Tent and summoned Aaron and Miriam. When both of them stepped forward, he said, "Listen to my words: "When a prophet of the LORD is among you, I reveal myself to him in visions, I speak to him in dreams. But this is not true of my servant Moses; he is faithful in all my house. With him I speak face to face, clearly and not in riddles; he sees the form of the LORD. Why then were you not afraid to speak against my servant Moses?" The anger of the LORD burned against them, and he left them. When the cloud lifted from above the Tent, there stood Miriam--leprous, like snow. Aaron turned toward her and saw that she had leprosy; and he said to Moses, "Please, my lord, do not hold against us the sin we have so foolishly committed. Do not let her be like a stillborn infant coming from its mother's womb with its flesh half eaten away." So Moses cried out to the LORD, "O God, please heal her!" The LORD replied to Moses, "If her father had spit in her face, would she not have been in disgrace for seven days? Confine her outside the camp for seven days; after that she can be brought back." So Miriam was confined outside the camp for seven days, and the people did not move on till she was brought back. This illustrates that meekness is controlling our actions and attitudes toward others. Rather than defend himself, Moses let God be his defender. After God took vengeance for Moses upon Miriam, Moses pleaded with God to heal her. Meekness is taking the Christ-road rather than the cultural road of our day. It is letting God be fully in charge of our motivations, attitudes, and actions rather than allowing others to dictate our mood, choices, and even our future. Meekness is being gracious when others criticize you. 5. When someone corrects you, are you teachable, or unreachable? Oh, this is a hard one for most of us. Who likes to be corrected? Even when we are corrected in love, it still hurts our EGO. We need a church that is full of “FAT” people. Sorry, that is probably not a good acronym, but it means…faithful, available, and teachable. The best way to learn is by listening and asking questions. It will be a lonely, mistake-filled life if we resist learning from others. Nobody has all the answers and insights. It’s like the man who was a witness in a court of law and the bailiff said, “Do you swear to tell the truth, the whole truth, and nothing but the truth?” The man answered, “If I knew the whole truth and nothing but the truth, I’d be God.” None of us have all the answers. A meek person is a teachable person. Eph 4:11-16 It was he who gave some to be apostles, some to be prophets, some to be evangelists, and some to be pastors and teachers, to prepare God's people for works of service, so that the body of Christ may be built up until we all reach unity in the faith and in the knowledge of the Son of God and become mature, attaining to the whole measure of the fullness of Christ. Then we will no longer be infants, tossed back and forth by the waves, and blown here and there by every wind of teaching and by the cunning and craftiness of men in their deceitful scheming. Instead, speaking the truth in love, we will in all things grow up into him who is the Head, that is, Christ. From him the whole body, joined and held together by every supporting ligament, grows and builds itself up in love, as each part does its work. 6. When someone restricts you, do you pray, or disobey? Philippians 4:5-7 Let your gentleness be evident to all. The Lord is near. Do not be anxious about anything, but in everything, by prayer and petition, with thanksgiving, present your requests to God. And the peace of God, which transcends all understanding, will guard your hearts and your minds in Christ Jesus. If we walk in meekness and wait on God when others restrict us to menial tasks, God can open the door to for us to do great exploits. David was restricted to shepherding sheep while his brothers were in Saul’s army. While visiting his brothers on the battlefield, God used David to defeat the Philistine, Goliath. And why did God use David? He was meek and spent his time worshipping God while doing menial tasks. David loved God, and when Goliath spoke against the Lord, David was motivated to defend God’s Name. Saul was out of his mind and out of options. He would throw anyone in front of the giant, as long as it wasn’t himself. He was surprised when a shepherd boy with no military training stepped forward to face the giant! Unable to dissuade David, Saul suggested that David use his armor, but it didn’t fit David’s style, his body, or his personality. David was accustomed to less armament and more dependency on God. That is a meek person—dependent on God, praying about everything with thanksgiving, full of peace and confidence in God, while their heart and mind stays focused on Jesus Christ. Although the meek will inherit the earth, the meek person is not motivated by this promise. His mind and heart are totally content with Jesus. The Lord gives the meek this inheritance because they can be trusted to use it for His glory. They will not become proud, nor use it to build their own kingdom. God can use the meek. If you want God to use you for His glory, become less self-important, become meek. Matt 18:1-4 At that time the disciples came to Jesus and asked, "Who is the greatest in the kingdom of heaven?" He called a little child and had him stand among them. And he said: "I tell you the truth, unless you change and become like little children, you will never enter the kingdom of heaven. Therefore, whoever humbles himself like this child is the greatest in the kingdom of heaven. Do want God to use you? Become the servant of all. Jesus said such a person is greater than John the Baptist, who was the herald of Jesus Christ. John the Baptist deflected all notions that He was important. He purposefully made himself less so Jesus could become greater. He pointed everyone away from himself and towards Jesus. Listen to what John the Baptist said. John 3:30-36 He must become greater; I must become less. "The one who comes from above is above all; the one who is from the earth belongs to the earth, and speaks as one from the earth. The one who comes from heaven is above all. He testifies to what he has seen and heard, but no one accepts his testimony. The man who has accepted it has certified that God is truthful. For the one whom God has sent speaks the words of God, for God gives the Spirit without limit. The Father loves the Son and has placed everything in his hands. Whoever believes in the Son has eternal life, but whoever rejects the Son will not see life, for God's wrath remains on him." Do you believe in the Son? If so, come to Him poor in spirit, mourning over your sin, and confess Jesus as your Lord and Savior. Give your life to Him in baptism and the Holy Spirit will give you a new life. The whole earth and the Kingdom of Heaven will be yours in Christ Jesus, for you will inherit it all as a child of God.